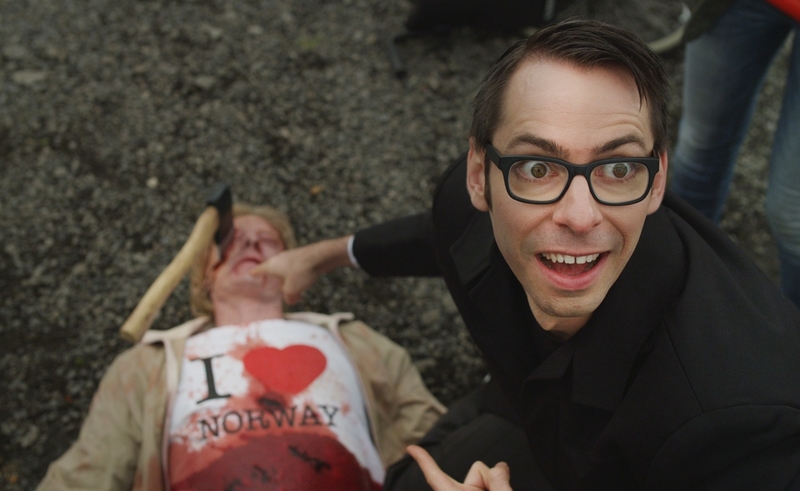 Tommy Wirkola’s new gore-fest Dead Snow 2: Red Vs. Dead makes the audience one promise and one promise only: At a certain point, a bunch of Nazi and Soviet zombies are going to just start whaling on each other. That may not be enough for cinematic greatness, but it must be said, the film keeps its promise. The first Dead Snow, which Wirkola directed in 2009, was a rote cabin-in-the-woods horror film with one innovation: dressing the zombies in Nazi uniforms. Dead Snow 2—the rare sequel that improves on the original—is campier, crazier, and so, so much grosser. Wirkola begins with the jump-scare that ended Dead Snow, as sole survivor Martin (Vegar Hoel) struggles to start his car as head Nazi zombie Herzog (Ørjan Gamst) reaches through the window to kill him. (Martin’s escape is complicated by the fact that he’s missing his right arm, having chainsawed it off in the last movie to forestall zombie infection. Also, the car is a stick shift.) One crash, some questionable surgery, and a not-very-convincing explanation for the mutilated bodies of all of his friends later, Martin is on the run from the police with a super-strong, uncontrollable zombie arm, multiple murder charges—some of which he’s guilty of—and, as always, Nazi zombies. There’s plenty of gore, some of it inventive, but it must be said: Comical disembowelment is becoming something of a crutch for the Dead Snow saga. The same is true for vomit, of which there is plenty, spattering windows, dripping from chins, stinking up cars. Even if it’s all too cartoonish to be genuinely nauseating, both the visual and audio effects could charitably be described as wet. The makeup is really all there is to look at—visually speaking, the film is aggressively uninteresting. But beyond all Dead Snow 2’s flaws, it’s important not to lose sight of the fact that it has undead soldiers in Soviet and Nazi uniforms straight-up swinging pickaxes at each other. This is a film in which Nazi zombies drive a Tiger tank over a sandbox full of adorable children. It’s the simple pleasures, really.